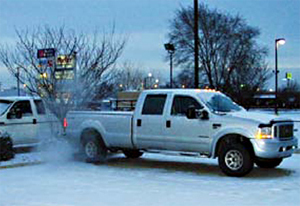 Good towing performance with related good fuel economy has been part of Americana’s design criteria for over 39 years. Our new RT38/39SB triple-slide display model was ready to ship from our Elkhart, Indiana upfitting center to our Colorado River factory order display location in Bullhead City, Arizona and Jerry Lemar and I (Russ Anderson) decided that we now had a good excuse to try out it’s towability and get towing data for a “wring out” report for our customers. 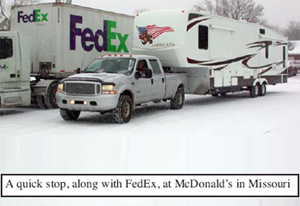 And right now, we could take advantage of the freight savings by doing our own driving/towing. So, in mid- December we zoomed off to Indiana from Arizona and 38 hours later, were at our hotel (the Fairway Inn) in Elkhart, Indiana. We also could take advantage of the time of year and deliver some Christmas gifts (very nice California wine) to our many great suppliers in the Elkhart area. Jerry doesn’t mind long stints at the wheel as he is an experienced long haul truck driver. He proudly told me the story about how his grandfather and family operated the oldest trucking company inArkansas. His grandfather started with a team of mules and wooden cargo wagon. I, personally, would really rather fly my airplane. Our dead-headed route to Elkhart was I-40 (over the 7300’ MSL divide at Flagstaff, AZ) to Oklahoma City and then Northeast to Elkhart. A huge storm was forming over the great plains and while we had excellent clear driving conditions, we had strong 25 to 45 MPH cross winds all the way from Texas to Indiana (over 1000 miles). Cross winds don’t help fuel economy. Starting in Bullhead City, we dialed in 65 MPH (our normal economy cruise) in the F350 and kept that cruising speed all the way to Elkhart. The miles to Elkhart were 1,983.3. We used 112.8 gallons of Diesel fuel, with an average of 17.6 MPG. Our constant driving companion was “Miss Garmin” who lives in the Garmin GPS. She says very little, unless a wrong turn is made or her directions are not exactly followed, . . . . Then she comes “unglued”. She likes to order a turn-around with perhaps a trip across farm land, while she re-calculates. That big storm which we had dodged while driving from Arizona to Indiana caught us “big time” in Elkhart. The entire route back to Arizona by I-40 was not passable, so we decided to head South, go through Dallas and then take 1-10 around El Paso, to avoid the really bad roads farther North. The roads through Illinois, Missouri, and Arkansas where hit by rime ice. Rime ice is rarely experienced at ground level. Super cooled (water below the freezing level) water droplets turn to ice when they hit a surface, like a vehicle’s windshield, fifthwheel or road. Treacherous towing, at the max! We passed one “snow bird wanabee” on the Interstate, whose fifthwheel had flipped over and was lying sideways across the interstate. He looked very forlorn, while chatting with the State Troopers, blue lights flashing and all. By the time we left Dallas, the ice was behind us. Then El Paseo was past. High buffeting head winds hit us in New Mexico and SouthernArizona. Not good for good fuel milage. About 48 Hours after we left Elkhart, we arrived at the our factory order display location in Bullhead City,Arizona. Our normal elected towing speed was 60 to 64 miles per hour, depending on road conditions. Great towing mileage results: We used 259.2 gallons of Diesel fuel, for the return 2,285.3 mile trip, averaging 9.2 MPG. The big (almost 40’ long) new RT model towed so smoothly, we hardly noticed it was there. The powerful Americana hydraulic disc brakes gave piece of mind while mountain towing, as they run so cool. 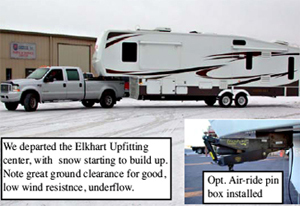 The RT’s standard self leveling fully adjustable Americana air-ride system, assisted by the optional air-ride pin box put bumpy roads to rest. 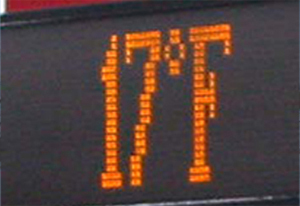 The RT’s light weight construction, strongly contributed to the excellent fuel mileage performance. The big tough RT weighs less than most other fifthwheels with 4 seasons insulation. Surprisingly, as it has heavy real granite counter tops and solid hard wood cabinetry. Our RT weighed in at 12,550 lbs, before we added special Americana features such as: 2000 watt inverter, 110 watt solar charging system, hydraulic disc brakes (replaced heavier electric brakes), compartment door trigger locks, pressure water fill system, 2nd front leveling jack motor, lighter tankless instant hot water heater (replaced heavier tank type heater), vessel bathroom sink and custom livingroom furniture. A great aerodynamic body shape with a smooth underbelly was another easy towing asset. Ford gave us 2nd gear but I don’t recall that 2nd was ever necessary. Our exhaust gas temperature (measure of an engine’s work load) never exceeded a very safe 850°F. A very nice & unexpected Southern Illiniois Christmas-time side story: We were getting close to Cairo, Illinois (just about as far South as you can go in Southern Illinois) as darkness closed in, Jerry decided it would be good to get off the Interstate and try some local barbecue. Jerry is a barbecue gourmet. So, we typed barbecue into Miss Garmin’s data base and she suggested we go to Mac’s barbecue and she gave us local directions, just .6 miles off the Interstate. When we arrived, there were cars outside the restaurant, so we parked the rig in the parking lot and went inside. There was a very nice assortment of hors d'oeuvres (appetizers to us country folks) spread out and about 30 folks sitting at a long table. The lady manager came over to talk with us and announced that they were closed and the group was at their annual Christmas party. 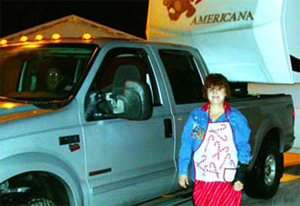 We then announced in a voice that could be heard by the entire group, that we were very disappointed as we had driven over 2500 miles to partake of their barbecue. Well, as it turns out the Christmas party group was the Cairo Fire Department Auxiliary and the Chief was 92 year old, James Simpson, who had been fire Chief for over 50 years. James invited us to stay, as their guests, but they were eating turkey dinner and not barbecue. We did! The dressing was great and Jerry and I have rarely enjoyed such fantastic green beans. We did make a small contribution to the volunteer’s general fund and wished them all a very Merry Christmas and our thanks again and we departed for our rig parked in the parking lot. 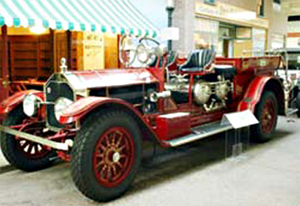 When the Auxiliary Firemen found out that we were from Arizona, they told us to be sure to see their restored 1917 American La France engine located at the Fireman’s museum on E. Main Street in Phoenix. We sure will.